Canadian jobs surge in January as jobless rate rises to 5.8%. In separate releases, the local real estate boards in Canada’s largest housing markets released data this week showing home sales fell sharply in Vancouver, edged upward in Toronto and continued robust in Montreal. Overall, higher interest rates, the mortgage stress test and in the case of Vancouver, measures adopted a year ago by the BC and municipal governments still keep many buyers on the sidelines. In Vancouver, home sales are in a deep slump, declining 39% year/year in January, though they were up 3% month/month. Sales in January were the weakest for that month since 2009–the depth of the financial crisis. Hardest hurt were sales of luxury properties. The Vancouver benchmark price fell 4.5%, which was the most significant decline since the recession. The area’s composite benchmark price now has decreased by 7.7% since the cyclical peak in June 2018. The number of listings rose sharply from a year earlier as sellers rushed to market fearing further price declines. In Vancouver, supply-demand conditions now favour buyers. Toronto home sales edged higher in January, rising 0.6% year/year. Sales were up 3.4% compared to December 2018. The benchmark price rose 2.7% compared to January 2018. The condo apartment market segment continues to lead the price gains. Toronto area supply-demand conditions remain balanced. Montreal saw a 15% year/year increase in sales last month. Demand remains robust as the number of active listings fell sharply. Benchmark prices of single-family homes increased 3% year/year, while condos prices rose 2%. Montreal is now a highly desirable sellers’ market, which is especially true in the single-family home segment in direct contrast to the underperformance of that sector in the GVA and the GTA over the past year. The Canada Mortgage and Housing Corporation (CMHC) said this week that the country’s overall real estate market remains ‘vulnerable’ despite an easing in overvaluation in cities like Toronto and Victoria in the third quarter of 2018. CMHC is using old data, as we already have numbers through yearend 2018 and preliminary data for January, all showing that overheating in Toronto and Vancouver has dissipated. Economists at CIBC and BMO this week highlighted that the tightened qualification requirements for mortgage applicants had slowed activity measurably. While raising the qualification rate by 200 basis points might have made sense eighteen months ago, when housing markets were red hot in Vancouver and Toronto and interest rates were at record lows, we are in a very different place in the economic cycle today. The Bank of Canada has raised the overnight benchmark policy rate by 75 basis points since the introduction of the new measures, which begs the question of whether 200 basis points is still the right number. The Office of the Superintendent of Financial Institutions (OSFI) introduced the B20 rules in January 2018 aiming to thwart a credit bubble amid inflated household debt burdens and frothy housing markets. The new rules force people who want a new uninsured mortgage to demonstrate they can manage payments at rates two percentage points above what’s being offered by a lender. The new rules have been very effective in cooling household borrowing and reversing the gains in overheated housing markets. Indeed, mortgage growth has shrunk to a 17-year low in Canada. Residential mortgage growth was posted at 3.1% in December from a year earlier, the slowest pace since May 2001, and half the growth rate of two years ago. The slowdown in housing has had a material effect on the economy as a whole. Weakened economic growth has moved the Bank of Canada to the sidelines. While the Bank is now more cautious in jacking up the policy rate to a neutral level, the residential mortgage market is now–in a stress-test perspective–well into restrictive territory. For example, the Bank’s policy rate is at 1.75% (well below the 2.5% rate the BoC considers neutral), while posted mortgage rate used for stress testing is at 5.34%. Statistics Canada released its January Labour Force Survey this morning showing employment increases of 66,800 versus expectation of merely a 5,000 job gain. 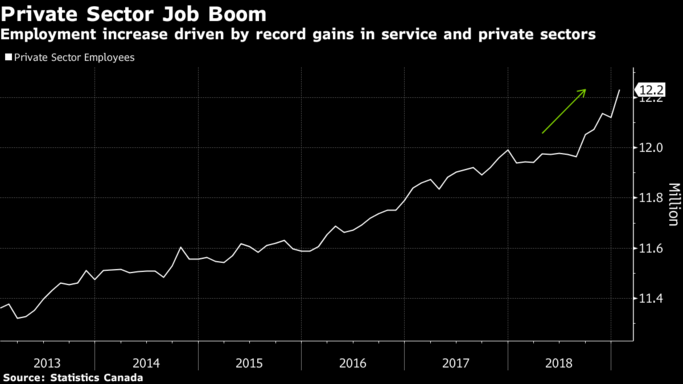 The surge was led by record private-sector hiring and service sector jobs for youth. This is good news for an economy facing considerable headwinds in the oil sector, weakening housing activity, volatile financial markets and falling consumer confidence. If sustained, the strong employment data will ease some concerns about the length and depth of the current soft patch. Even with the strength in job creation, the unemployment rate jumped 0.2 percentage points to 5.8% as more people looked for work–a sign of strength. This suggests there is more capacity in the economy before inflation pressures begin to mount–a big point for the Bank of Canada. Economic growth is now hovering around 1%, but the Bank of Canada expects it to recover to about a 2% pace in the second half of this year. The central bank will remain on the sidelines until it can verify that a rebound is occurring. Wage gains remained depressed, a key indicator for the Bank. Average hourly wages were up 2% from a year ago, with pay for permanent employees up 1.8%. Alberta, which has been flattened by slumping oil prices and production cuts, posted a second consecutive monthly decline in employment. Ontario led the job surge followed by Quebec. Sherry is an award-winning authority on finance and economics with over 30 years of bringing economic insights and clarity to Canadians. May 26th, 2015 | Posted in: Chief Economist, News. May 8th, 2015 | Posted in: Chief Economist, News, Press Releases. Apr 15th, 2015 | Posted in: Chief Economist, News. The purchase of a home is the largest purchase most people make during their lifetime. At Dominion Lending Centres, we want to make each and every purchaser aware of the many mortgage options available to them prior to their purchase and closing date. Dominion Lending Centres Commercial has established excellent relationships in the lending community with pension funds, banks, credit unions, life insurance companies, trust companies, private institutions and individual investors. A Dominion Lending Centres leasing professional can help you in discovering multiple ways to structure lease financing for new equipment, a sale-lease back to extract capital from existing assets, or solve other equipment acquisition opportunities.